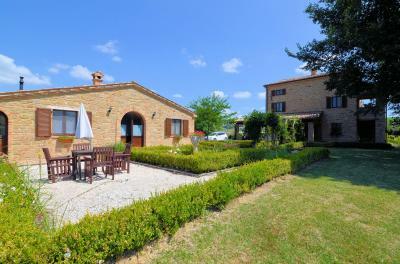 At just 1 km from the old Town of Rapagnano, elegant typical renovated farmhouse with large garden and olive grove. The farmhouse, renovated in 2003 has at ground floor a kitchen with dining room, large living room with wooden stove, bathroom and a small storage room. On the first floor there are three bedrooms, one with large en-suite, and a shared bathroom. The second floor is an attic now consists of two large rooms used by the owner as two additional bedrooms for guests. The house also has two large external characteristic portici made of wood and brick columns, accessible from the kitchen and from large living room, where you can stay and enjoy a wonderful view of the surrounding hills. The entire property is completely fenced and has a lovely garden of about 6500 square meters full of flowers, with 90 olive trees (which produce an excellent oil), cherries, apricots, apples and other fruit trees as well as a private well and a small pool. In the garden there are also two wooden outbuildings used as storage for tools. 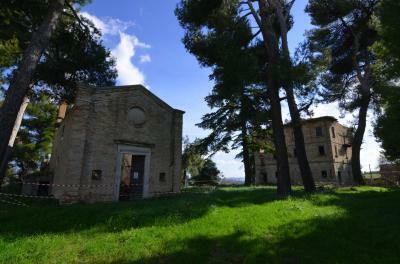 The entire property is spread at the end of a small but comfortable public road and enjoys a stunning view of the ancient and picturesque village of Rapagnano and some neighboring Countries. All services are within a few minutes while the Adriatic Sea is only 25 km.